Yesterday I wrote a guest blog post for Edutopia on 21st Century Assessment and learning. In order to keep things concise, I only provided a brief example of how to incorporate this type of learning into the classroom. However, today I am going to share my wikispace and show you one of my assignments that I am starting today with the novel The Kite Runner. The assignment covers a variety of skills and objectives and asks students to seek out information, think critically, and answer a question. This question does not have one solution and is open to interpretation. I am asking students to present their findings using any method they see fit. In order to keep track of progress each student will be sharing a Google Doc with me and are required to update their daily progress and provide a summarized brief of tasks, roles, and what they accomplished for the day. I have found this method is essential when using group work forums. Students can easily get lost or skim by in a group, therefore, it is essential to track their progress and have them assess each other. Here is the assignment. You can also access my wikispace with this assignment and other ways in which I have been using this platform and incorporating various learning tools. 1. Go to the Springfield Township Library Search page. Use Google "News Timeline" to research the Soviet occupation of Afghanistan. Remember, this occupation started on December 24, 1979 and lasted until February 1989. How is the Soviet occupation of Afghanistan representative of what is happening in The Kite Runner thus far? What effect does this occupation have on family and traditions in Afghanistan? A daily brief summarizing what you accomplished for the entire day. Did you answer your question? When you are doing your research you must always refer back to your question. I'm not looking for a concrete solution, but I'm seeking you to think critically about the subject and follow through with supported opinion and a logically constructed answer. Did you play an active role in the group? What role did you play in your group and did you participate actively and equally with all group members? If you and your group can answer yes to both, then you will receive full credit for this component. Did you present well? Is your presentation method creative and interesting to the class? Did you think "outside the box" and move beyond a powerpoint or create a dynamic powerpoint that serves as a backdrop rather than a slide inundated with bullet points? Knowledge of content? Did you discover the symbolic meaning of this invasion as it is related to Kite Runner? Did you present the material in a way in which you know and understand what you are talking about, rather than letting the powerpoint talk for you (i.e. DON'T KILL US WITH BULLET POINTS!). NOTE: A special thanks to Joyce Valenza (@joycevalenza) for creating an amazing student research start page at Springfield Township HS Library. I was the first camper through the door. I entered to cheers and raised arms by the wonderful edcamp team. My initial thought, “I’m never early. I’m always late and hardly ever on time.” I met everyone - some for the second or third time - and received the inaugural t-shirt from Hadley Ferguson (@hadleyjf). I was set. I wasn’t sure what to expect from an “unconference”. It was my first time attending one and I was anxious to experience the forum. I decided to sign up and lead a session. I had something in mind that I had been discussing with Mary Beth (@mbteach) for some time. I never led a session, but felt that I really wanted to start a conversation. Recently, I had been hired as the Instructional Technology Specialist (ITS) at the Boys’ Latin Charter School of Philadelphia. I proposed the idea for this position in October of 2009 and had seen the proposal all the way through to my new position. Now I am stuck. I’m not clueless, but I want to do this job well. I am the pilot of this position. No one came before me. There is no precedent. What does an Instructional Technology Specialist look like? This is what I called my session. I fixed my index card to the bright, yellow board and worked my way into the main conference room. I met with a few old friends and some new ones at a round table. I met up with Yoon (@doremigirl), Rich (@rkiker), and David (@DrTimony) for some coffee and discussion. Rich and I traded small talk and soon found out he had my position for three years. He offered to co-present and I gladly accepted. Our session would RULE! We began tweeting our session around edcamp and offered door prizes. But before we get to the door prizes, let me reflect on my first two sessions at edcamp. The first session I attended featured Joyce V. (@joycevalenza) and David J. (@djakes) I worked with Joyce at Springfield Township and she turned me on to many new trends in education. One of our first assignments together was visualizing vocabulary. Students took pictures of their vocab words, uploaded them to flickr, and suddenly senior vocabulary was cool again. Joyce and David led a session on “The Future of Student Research”. This session was not only informative, but presented many great questions and hurdles that we all face in conducting student research in schools, restricting access being the most common. More and more, IT and Administrators are filtering the internet and restricting access to what students can see while on the school’s server. I still don’t understand how we expect our students to seek out information when half of the pages of the book are torn out. Didn’t Ray Bradbury warn us against this once? Didn’t George Orwell live this nightmare? The consensus in the room was that there are a lot of good resources out there for our kids to access information. On the same token, there are a lot of “crappy” resources out there that kids are actually using for research and getting good marks for it. We need to teach our kids to filter through the jungle of information on the internet. They have access to more information than any generation in history. Our responsibility, as teachers, is to give them the tools to get to the most credible and legitimate information out there. Moreover, IT and Administrators cannot limit that scope. They need to ensure our students are browsing and searching responsibly, but on the same hand, having access to all available sources. My next session talked about two sites that I plan on incorporating into the Boys’ Latin project based learning units next fall. The session was delivered by Mike (@mritzius) and Nicolae (@nborota). They shared their experiences as classroom teachers using Project Foundry and Moodle. I left this session and edcamp very impressed with the comprehensive nature of Project Foundry. Until today, I had never really heard much about it, but I found myself modeling a similar, free application in my own classroom: A wikispace. However, the one element that I really enjoyed about Project Foundry is its ability to catalogue everything a student does throughout the course of high school, and at the end of their senior year, they have a digital portfolio to take with them on a DVD. Plus, this program puts the student in the driver seat and places the onus on the student to get their work done in a timely manner. I plan on looking into this program further and hopefully integrating it into our PBL units next year. And now, back to door prizes. Our session started with my plans and fears as I move into this new position. I started by giving my background and my visions for the position. I relayed my plan to start with a survey monkey. Not actually a monkey that goes around soliciting answers for coins (although this would be awesome), but an actual website that is great for free surveys. I expressed my idea of wanting the faculty to tell me what they wanted to do with technology rather than telling them they have to use a wiki or have to use Google Docs. I’ve seen this before and it never takes off. Plus, one will always encounter uncooperative faculty when it comes to trying anything new. They have been doing it the same way for years and there is no way they will be changing now. And that is fine. Be an Edu-saur. Enjoy it. The final session I attended focused on the wonderful world of Google Apps. Again, this was another lively session that could have lasted for days, if not weeks. This session was led by Rita (@rchuchran) Frank (@Fronk2000), Karen (@SpecialKRB), and Kristen (@kristenswanson). This session involved a lot of collaboration and sharing of ideas. We all spoke up and disclosed our best use of Google Apps. Everyone said something completely different and we all agreed that Google Forms rule. This was a fulfilling day in many ways. I left wanting more. 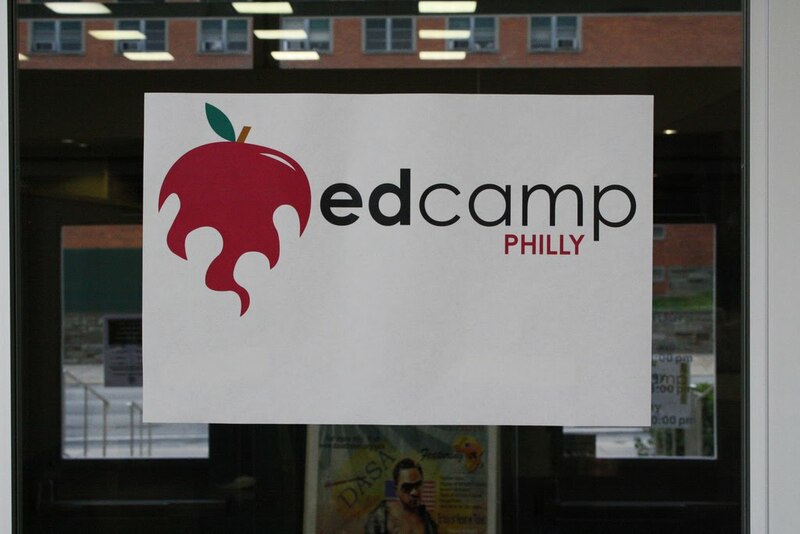 I wanted edcamp to last for a week, maybe more. The conversations were rich and thought provoking. I left better than when I entered as the first camper that morning. I think I speak for all attendants when I say this is the model we want all of our schools to emulate. These conversations need to fill our halls and trickle down to our students. I want my students to leave my classroom like I left an edcamp session; I want them continuing the dialogue far beyond the parameters of school. Edcamp provided all of this along with a really cool t-shirt. Thank you edcamp. I plan on being first every year. A month ago I was hired to be the Director of Instructional Technology at Boys’ Latin Charter School. I proposed the idea in the fall of 2009 and the idea soon became a job proposal. I interviewed, was hired, and now I’m devising my next steps as our school year winds down towards the summer. At times I feel overwhelmed with seeing this position through and finding the time to keep track of everything I want to accomplish for next year. On top of that, I’m also designing the curriculum for the AP English Language and Composition course that Boys’ Latin will be offering for the first time next fall. So where do I begin? Where do I start? Should I just tell all of my colleagues to begin belching into voicethread, followed by a transitional roller coaster prezi that ends with a thirty second animoto clip? This plan is probably not the best idea unless my goal is to acquire seething stares rather than tech driven lesson plans. Ok, so this is the part where you give me an answer. Give me some direction! I’ve decided to divide this process into three steps. Three bullet points that will help me guide the next 6 weeks of school and not drive my exhausted colleagues crazy. Survey Monkey, of all the monkeys, you’re my favorite. And I will use you to find an ideal starting point for fusing technology and curriculum at Boys’ Latin. The one thing faculty members can’t stand is a PD that throws technology at them and does not provide ample time to break it, fix it, and learn it. Technology should be introduced in summer PD sessions and allot enough time for your faculty to find a comfort level with the new application they are using while not being overwhelmed by grading, parent emails, and planning. I’ve seen former colleagues put their laptop screens down during an ed-tech PD and stare at the presenter for the remainder of the session. There is always one. Getting that one on board is my goal. Finally, this survey will give me insight into what my faculty wants to do with technology in their classroom. I have seen districts force teachers to use technology just so they could look like a tech driven school. This never works. Teachers can present 21st century lessons and learning without having aspect of technology in the classroom. The grand assumption in 21st century learning is that classrooms need laptops, cameras, wikis, moodles, pods, etc. But that’s not true at all. 21st century learning skills take the context of contemporary times; bring those ideas into the classroom through varied lessons, assessments, and collaborative projects that provoke student learning. One of the greatest skills a student can have in the 21st century is the ability to filter through a plethora of information and seek the best pathway to an answer. Tangible technology is only one component of this new style of learning. The one element that is lacking at Boys’ Latin is interconnectedness between Administration, Faculty, Students, and Parents. At the beginning of the year we were given cell phones, but only half the faculty consistently use and charge them (I suggested Google Voice Numbers). Some of us are on twitter and most are on Facebook. I know a few colleagues who understand the brilliance of using Google Docs, but for the most part, go unused. This is sad. Because most districts, charter schools, and private schools have the ability to connect like never before, but are not using these forums effectively. All of these applications are free and require little effort and time to manage. Here is where I hope my new position can shine in the early stages. I’ll start by introducing a handful of applications that will unify the school’s tangled web of communication. I plan on starting with a wikispace where all of my colleagues can share resources: links, blogs, wikis, etc. This gives everyone a chance to share and build a resource library. The next step will be to get all of my colleagues signed up on twitter. I have gained so much from having a twitter account and creating a personal learning network of teachers around the globe. Imagine an entire school community using this forum effectively. The possibilities for interconnectedness and collaboration are endless. Teachers can share resources, updates, and plans that go far beyond the school web page. Finally, I want to give the faculty candy. Yes, candy. Here is a Butterfinger or a packet of gummy worms for trying out this new technology. I want to keep it simple and allow them to break it, fix it, and learn it. I don’t want to overwhelm them with every clever new presentation tool or acronym floating around the Ed-tech movement. In the end, let them play and give them candy. I want to sit down with each department and work on creating collaborative lessons and projects that are inquiry based, provoke student thinking, and challenge students to seek out the best answers to questions they generate themselves. The focus in these meetings will be the content, standards, and objectives that each project will highlight. In many planning meetings and classrooms I notice technology abuse. Teachers use technology as the focus of the lesson and forget that the content, standards, and objectives still drive lessons and always will. The meeting outcomes will not resemble a well constructed lesson plan, but simply content that my colleagues wish to enhance through the use of a collaborative technology project. My job is to turn that content into a lesson that will use technology and align to 21st century skills. These are my first and next steps as the newly appointed Director of Instructional Technology or as the call me on the streets, “MC DIT”. As some of you quickly email that attempt at humor to fail blog, stop for a minute, and give me your feedback on my progression. Offer suggestions and constructive criticism. I’m sailing into uncharted waters and have an idea of what course I want to take, but sailing with an experienced crew is much better than going at it alone. Thanks for reading and be sure to check in as I chronicle my experiences as Director of Instructional Technology. *Image Courtesy of "God At His Computer ." Atheist/Agnostic. Web. 7 May 2010. .